MISSOULA – The University of Montana’s mission to shape agile learners will take a step forward thanks to a $300,000 grant from the W. M. Keck Foundation. The grant will help UM faculty members in neuroscience, literature, psychology, philosophy and languages create courses with neuroscience themes for both science and non-science students. This new undergraduate curriculum – which builds on UM’s growing neuroscience major – stresses the impact of fast-evolving brain science on our understanding of a wide range of human experiences, including literature, history, art, language and education. Students majoring in the humanities or social sciences will have new opportunities to explore neuroscience and increase their scientific literacy on topics of increasing social relevance, such as Alzheimer’s disease and addiction. Students majoring in a science field will become more adept critical thinkers as they are exposed to the analytical approaches used by those in the humanities and other areas. All students will enhance their critical-thinking and communication skills while collaboratively exploring how our understanding of the brain and cognition influences a diverse range of fields. The courses also will include a strong emphasis on research to keep students at the forefront of these topics. To have a greater impact across Montana, specific neuroscience units are being developed for education students pursuing training as K-12 science teachers. Leading the project from the College of Health Professions and Biomedical Sciences is Regents Professor Richard Bridges, director of UM’s Center for Structural and Functional Neuroscience. Bridges worked with faculty members Ashby Kinch (English), Sarah Certel (biology), Nathan Insel (psychology) and Christopher Comer (neuroscience) in the College of Humanities and Sciences and Martin Horejsi (teaching and learning) in the Phyllis J. Washington College of Education and Human Sciences to design this multidisciplinary program. “We are grateful to the Keck Foundation for recognizing UM’s exceptional ability to integrate STEM education with the many disciplines in the humanities in which our faculty excel,” said Provost Jon Harbor. Dean Jenny McNulty of the College of Humanities and Sciences echoed that opinion. The new curriculum will be in place for fall semester 2019. Current estimates suggest upward of 1,000 students will benefit over the initial three-year period of the grant. Bridges hopes the project establishes a blueprint for other strong science and technology programs at UM. “Once we prove the effectiveness of this education model, it can be used to link any number of science disciplines with the humanities, social sciences and arts – possibly even with business and law,” he said. This is the first grant that UM has been awarded from the Keck Foundation. Bridges is optimistic the funding will inspire further private support for this and similar programs. “Keck Foundation grants are extremely competitive, and receiving one highlights not only UM’s growing neuroscience program, but also the tremendous value that lies in building dynamic interdisciplinary academic programs that will ensure the success of a wide array of UM students,” he said. The grant is part of Campaign Montana, a comprehensive, seven-year fundraising campaign that aims to inspire $400 million in philanthropic giving to the University of Montana by the end of 2020. Donors will help achieve UM’s vision of a university that puts student success at the forefront, driving excellence and innovation in teaching, research and learning. The campaign is managed by the UM Foundation, an independent, nonprofit organization that inspires philanthropic support to enhance excellence and opportunity at UM. Visit www.campaignmontana.org to learn more. Based in Los Angeles, the W. M. Keck Foundation was established in 1954 by the late W. M. Keck, founder of the Superior Oil Company. The Foundation’s grant making focuses primarily on pioneering efforts in the areas of medical research, science and engineering and undergraduate education. The foundation also maintains a Southern California Grant Program that provides support for the Los Angeles community, with a special emphasis on children and youth. The center fosters multidisciplinary research and training at the interface of molecular neurophysiology, cellular neurobiology and molecular neuropharmacology. 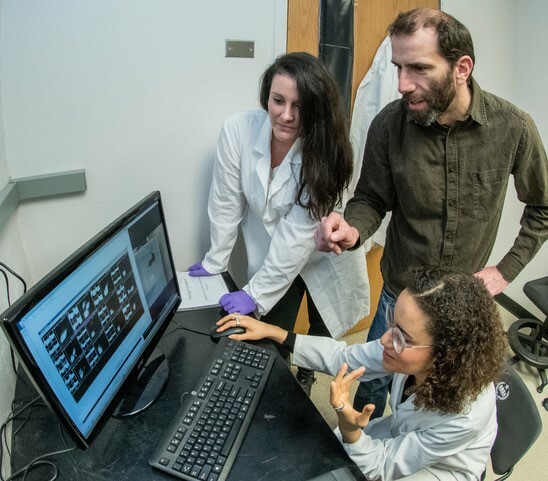 A diverse group of faculty representing synthetic chemists, molecular biologists, physiologists and clinicians form a dynamic and collaborative neuroscience research group. Learn more at http://health.umt.edu/csfn.